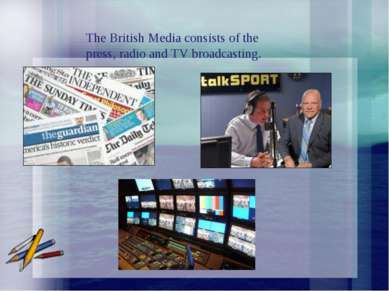 The British Media consists of the press, radio and TV broadcasting. The "quality" papers are for more serious readership. These papers are bigger in size, with larger articles and more detailed information. 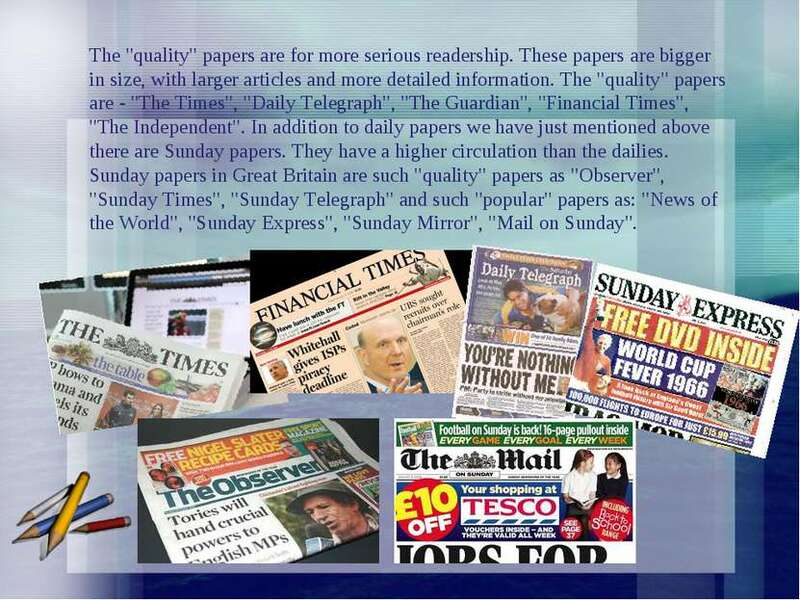 The "quality" papers are - "The Times", "Daily Telegraph", "The Guardian", "Financial Times", "The Independent". In addition to daily papers we have just mentioned above there are Sunday papers. They have a higher circulation than the dailies. Sunday papers in Great Britain are such "quality" papers as "Observer", "Sunday Times", "Sunday Telegraph" and such "popular" papers as: "News of the World", "Sunday Express", "Sunday Mirror", "Mail on Sunday". 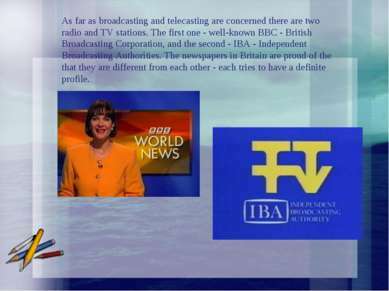 As far as broadcasting and telecasting are concerned there are two radio and TV stations. The first one - well-known BBC - British Broadcasting Corporation, and the second - IBA - Independent Broadcasting Authorities. 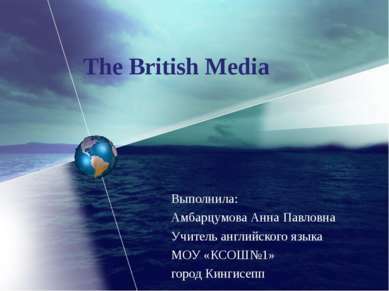 The newspapers in Britain are proud of the that they are different from each other - each tries to have a definite profile. 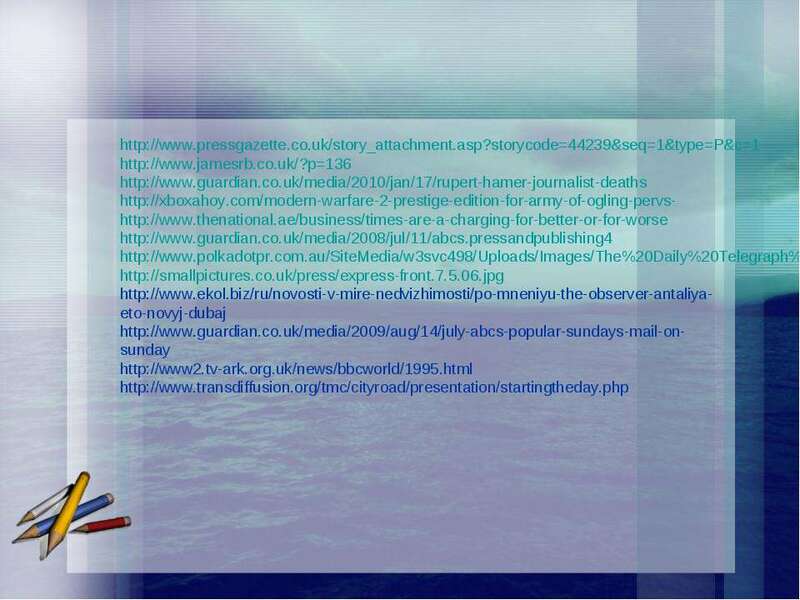 Now a couple of words about papers. First of all there is no subscription. You may buy any on sale. 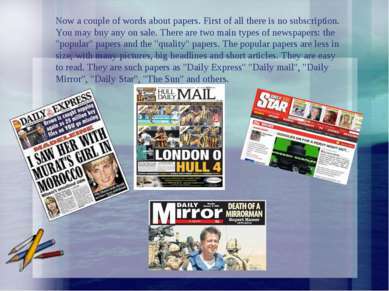 There are two main types of newspapers: the "popular" papers and the "quality" papers. The popular papers are less in size, with many pictures, big headlines and short articles. They are easy to read. They are such papers as "Daily Express" "Daily mail", "Daily Mirror", "Daily Star", "The Sun" and others. Vocabulary: subscription- подписка on sale - в продаже readership - читатели circulation - тираж Questions: 1. What does the British Media consist of? 2. What are two main types of newspapers in Britain? 3. Who are the "quality" papers for? 4. Which newspapers have a higher circulation than the dailies? 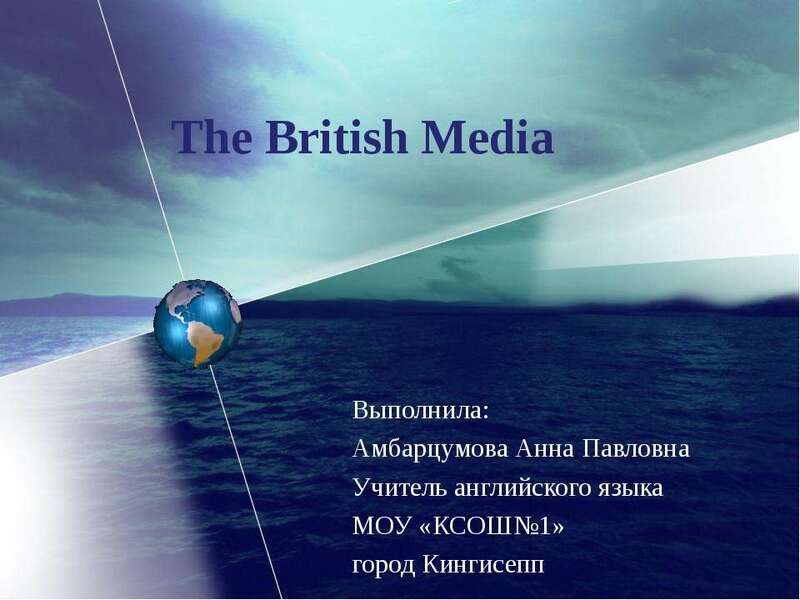 How to teach children to understand mass media ?